Comprehensive loudspeaker systems are installed in stations, stadiums, department stores or other large facilities and buildings so as to enable announcements to be made, for example. 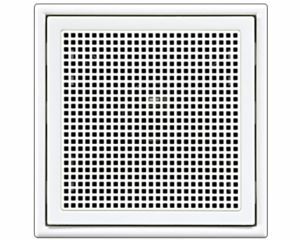 Often 100 volt technology, the so-called PA (public address) system is used to implement this. The advantage here is that the output voltage of the amplifier is converted by means of a transformer to 100 volts at maximum power. This way it is possible to transmit over relatively thin cables and also over longer distances without noteworthy losses. It is also advantageous to group several loudspeakers together in parallel at an amplifier output. With the PA module JUNG offers the corresponding technology so that JUNG loudspeakers can be connected together in indoor rooms, and this guarantees the best sound. Available in the A, CD and LS series for an attractive appearance.